In this guide, we are looking at Everything You Need To Know About Inflatable Hot Tub Chemicals. It can be confusing – and maybe even a little scary – when you buy your inflatable hot tub, and realize that you are going to have to buy some chemicals as well. Well, please don’t worry. Our guide is here to explain all about the chemicals you need to buy and how to use them. We also look at any issues you might have with the water in your hot tub, and have made an easy-to-read table which shows you what to do in order to solve those problems. So even if you have zero understanding of chemicals, chemistry, or science, go ahead and read this article – and we suggest you refer to it from time to time – and you’ll be equipped to keep your inflatable hot tub functioning perfectly. We break it down for you, so you can understand all the different chemicals and the reason you put them in your hot tub water. By working out what you need, we also hope we can save you money. After all, it’s too easy to buy up boxes of chemicals in those early days of confusion, only to find out that you didn’t really need them all! First off, a sanitizer is the most important chemical you need to add to your hot tub water. We have an article which goes into great detail about using sanitizers in your inflatable hot tub: How To Keep The Water Clean In Your Inflatable Hot Tub. However, if you came here first, then a summary of the main points will definitely help you understand this crucial part of owning an inflatable hot tub. The reason a sanitizer is the most important chemical, is because it keeps the water in your portable hot tub clean and hygienically safe. It does this by attacking and destroying any harmful bacteria and algae that might build up in the water. Hot water can be a breeding ground for all types of germs, so it’s vital you add a sanitizer to kill off these bacteria before they can do any harm. Even if the water in your hot tub looks sparkling fresh and clean, you must add a sanitizer from the get-go so it can kill off any invisible nasties. In this area, never trust to luck. So, from the moment you buy your inflatable hot tub, you need to have sanitizer ready to add before you set foot into the hot tub. Once the water is hot and bubbling away, that’s when you add your sanitizer – and from then on, you regularly check the level of sanitizer in the water is correct. If it is: fine. If it isn’t: you add some until it is at the correct level! destroying bacteria, and it is the cheapest sanitizer you can buy. However, it is also has a slight odor, and therefore some inflatable hot tub owners prefer bromine. Do you remember going to the public swimming pool and there was that chemically smell everywhere? That was the smell of the chlorine that was added to the pool water. So if you decide to use chlorine in your inflatable hot tub, then that’s the smell you might get – although it will not smell anywhere near as strong, because your hot tub is a lot smaller. Strangely, the smell of chlorine in a hot tub is actually a good thing. That’s because chlorine only smells like that when it is ‘dying’. And the reason it dies is when it attacks and destroys harmful bacteria in the water. So when you smell chlorine coming off the water in your portable hot tub, that means it’s doing its job! You use chlorine tablets in the plastic chemical floater that comes with your inflatable hot tub. Your owner’s manual or dvd will tell you how many tablets to add, but it’s usually between 2-6, depending on the size of your hot tub. Simply put the correct number into the floater and drop the floater into the hot tub water. The tablets are slow dissolving, so the chlorine will gradually spread through the water and start to work. Therefore, you will need to wait at least 2 hours before you get into the hot tub. As the days go by, you regularly check the levels of chlorine in the water – which we explain in a moment – and add more tablets if required. On average, chlorine tablets last 3-5 days. This means you are going to need a lot over the course of using your hot tub. Therefore, it’s worth getting hold of a large container of tablets, such as the 8lb tub of RX Clear Slow Dissolving Chlorine Tablets over on Amazon, where they always have a great deal. To use chlorine granules as your sanitizer, you can either add the correct amount directly to the hot tub, and let the heat of the water dissolve them and the airjets send them swirling around. Alternatively – and the method we recommend – you put the correct amount of granules in a plastic pitcher, add some hot water from your hot tub, stir the water around until the granules dissolve, then pour the mixture into your hot tub. In this way, you know the granules have fully dissolved and set to work immediately. Whichever method you choose, you still need to wait at least 2 hours before you can use your hot tub. With granules, we always recommend buying them in a smaller-size container than you do with tablets. That’s because once the container is open, it’s more susceptible to moisture and decomposition than tablets. Our preferred chlorine granules are the Spa 56 Granules by Leisure Time who offer different packages over on Amazon, which you can check out by clicking here. Bromine is the second most-popular choice of sanitizer amongst inflatable hot tub owners. It’s equally effective as chlorine at keeping the water clean, and it has the advantage of being odorless. However, bromine costs more than chlorine, and that prevents many people from using it. It also doesn’t last as long as chlorine, so you will need to add it more frequently to the water in your inflatable hot tub. This, of course, also drives up the cost. As with chlorine, you can use either bromine tablets or bromine granules. The procedure for each is the same as with chlorine – the tablets fit into the plastic floater and dissolve through the water, the granules go directly into the water. 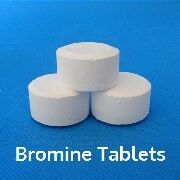 As with chlorine tablets, it’s always worth buying a large container of bromine tablets, as you’re going to use a lot over the course of owning and using your hot tub. One of the best options comes in a 5lb tub of Spa Choice Brominating Tabs. They’re also available over on Amazon. To read more – or just to check out their current discount – you can follow this link. The main difference between chlorine and bromine, and one that you need to keep in mind, is that because bromine is slower to work in the water, you need to wait longer before you can get into the hot tub. The minimum recommended time is 4-8 hours, depending on the size of your hot tub. You might even prefer to add the bromine and leave it all overnight before using your hot tub. Some owners prefer to use this method: they sprinkle some bromine granules into the hot tub at the end of the day, then slip the cover on and leave the hot tub to do all the work. The water is then ready-to-go by morning. Again, we recommend you buy smaller containers of bromine granules, such as Spa Choice Brominating Granules, which come in 2lb containers over on Amazon. Using minerals is a lesser-known option as an inflatable hot tub sanitizer. It is most often a mix of silver, copper, and other minerals, which act together to kill the bacteria in the water. However, minerals are not a substitute for chlorine or bromine! They simply reduce the amount of chlorine or bromine you need to add to your hot tub water. So if you want to use a mineral sanitizer, you are still going to have to add a small amount of either chlorine or bromine to work together with the minerals in sanitizing your hot tub water. You’re also going to need some oxidizer as well. So as you can see, using minerals as your main sanitizer is not only a little more complicated, it can work out quite expensive as well. That said, a number of hot tub owners much prefer using a mineral sanitizer, such as the Nature 2Spa Mineral Stick. However, we have to say it is a bit clunky to use, as you have to find a way of tying or wedging it to your filter housing. If you want to see what hot tub owners are saying about this product, you can click here and head over to Amazon. The top patch on the strip shows the chlorine or the bromine level of the water. Once you have added sanitizer to the water, and started using and enjoying your hot tub, you need to periodically check the sanitizer is at the correct level. It’s super-easy to do this, and requires no knowledge of science! To do this, you need to get hold of some water-testing strips, such as the Poolmaster 4-Way Spa Test Strips, which are sold easily and cheaply over on Amazon. You get 50 test strips in a small tub, and each strip can be used to test 4 different chemical levels of the water in your hot tub. That’s because each strip has three different patches on it: one tests the pH of the water (more about that in a while); one tests the Total Alkalinity of the water (again, we cover that soon); and the third strip tests the chlorine or the bromine level of the water. Sanitizer levels are measured in parts per million – or ppm – and you are checking that your sanitizer is at the correct level, within a very small range. But rather than having to do some complicated math or reading off a complex scale, the test strip container has the scale in easy-to-read color coding. So you simply dip the test strip into your hot tub water, holding it about 6 inches under the surface for a few seconds. Then take the strip out of the water, wait about 20 seconds, and then hold the strip against the correct color scale. In the photo, you can see that the sanitizer patch (the top one on the test strip) has turned lilac. If you now look at the top scale on the container – the one labelled FCI – you can see that this lilac color falls perfectly within the ‘OK’ range. This means the sanitizer level in the water is correct. Your inflatable hot tub will need to be shocked every now and then. This is also known as oxidizing. Basically, shocking your inflatable hot tub means adding large quantities of chemicals to the water to break down any organic waste there may be in the water, such as skin cells, hair, body oils, and so on. Shocking also destroys any contaminants that cause the water to smell or make the water turn cloudy or even green. Shocking also reactivates the chlorine or bromine in the water – when it has been working hard and become a little ‘tired’ – turning it back into an effective sanitizer. Manufacturers generally recommend shocking your inflatable hot tub every week, but it really depends on how often your use your spa and how many people regularly use it. We generally find that once every two weeks is fine, even with daily family use. The amount of shock you need to add to your inflatable hot tub varies according to the product you are using and how much water your hot tub holds. You must always read the product instructions carefully to check the recommended amount required for your hot tub. If you use a chlorine sanitizer, then chlorine granules are a highly effective way of shocking your hot tub, as they destroy any contaminants and matter in the water powerfully and quickly. They also oxidize the old dead chlorine, turning it into a gas, which then escapes into the air. The drawback of adding chlorine granules as a shock is that it will give the water that strong chlorine ‘public swimming pool’ smell while it’s doing its work. Some people find this unpleasant as it irritates their eyes and nose. However, if you shock your hot tub overnight, then this reduces the effect. It doesn’t stop the smell happening, but it means you’re not around the hot tub while the shock is doing its work. To shock your portable hot tub with chlorine granules, you should turn on the air jets, and add 1oz of granules for each 500 gallons of water your hot tub holds (that’s about 1 tablespoon of granules). Put the cover on and leave the air jets going for an hour, then switch them off, and leave your hot tub overnight (or for several hours if you’re doing it during the day time). As we say, you don’t need to buy a special chlorine shock, you can use the same chlorine granules you use to sanitize your hot tub. 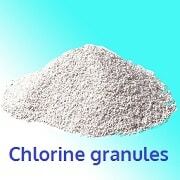 If you use chlorine tablets, however, you are going to need to buy a container of chlorine granules. Spa 56 Chlorinating Granules are a great product to use. Amazon have a range of bundles on offer, from a single bottle up to a 12 pack. You can read owners reviews of these granules, or check out the current deals, by clicking here. If you use bromine as your sanitizer, than you can use bromine granules to shock your hot tub. The procedure is the same as it is with a chlorine shock. You add a tablespoon of granules to your hot tub water at the end of the day, turn on the air jets for an hour, put the cover on, then turn the jets off at the end of the hour, and leave the hot tub overnight. An advantage of using bromine as a shock means you don’t get the odor that you get with chlorine. You can see that the bromine granules we recommend as a sanitizer are also great to use as a shock. These are the Spa Essentials Brominating Granules, which come in 2lb containers. If you follow the link, you can check out some great multi-pack deals over on Amazon, and also see what other hot tub owners say about this product. An alternative to using either chlorine or bromine granules is to use a non-chlorine shock. This works in the same way as granules, to clean, refresh and re-boot your hot tub water. However, because it doesn’t contain chlorine, you don’t get that strong chlorine smell while it does its work. To use non-chlorine shock, you follow the same procedure as you would for chlorine shock, by adding a tablespoon or two of the shock to your hot tub with the air jets turned on to circulate the shock through the water. An advantage of non-chlorine shock, is that you don’t have to wait as long before you can use your hot tub, as there is no strong chlorine odor or high chlorine levels in the water. A great performing non-chlorine shock is Oxy-Spa Non-Chlorine Oxidizing Shock, which has received strong reviews and recommendations on Amazon. It’s important to remember that, before you get into the water, you need to use a test strip to make sure the chlorine or bromine level of the water is back at the correct level. If it is at the correct level, then you’re good to go. If the level is a little high, leave the cover off for a while and run your air jets. The excess chlorine or bromine will soon evaporate and you can use your hot tub. If the levels are a little low, add a small amount of the sanitizer granules you use to the water, or pop another tablet or two into the chemical floater. Then run the air jets and wait for 30 to 60 minutes before getting in. In our article How To Test The Water In Your Inflatable Hot Tub, we look in great detail at how to check – and alter if necessary – the pH levels of your hot tub water. As you’re here, though, we’ll distil that advice into a simple guide that will help you understand this area of inflatable hot tub ownership. To start with, then, you need to maintain the correct pH levels of the water in your hot tub so that the sanitizer keeps working as efficiently as possible. pH is a measure of how acid or alkali the water is in your inflatable hot tub. It uses a scale of 0 to 14 to show the pH value, with 0 being extremely acidic and 14 being extremely alkaline. The number 7, right in the center, is known as Neutral. The pH value of the water in your inflatable hot tub should be between 7.2 and 7.8, which means it needs to be ever so slightly slightly alkaline. If the water is too acidic or too alkaline, then it can damage the water heater, filter, and massage jets. 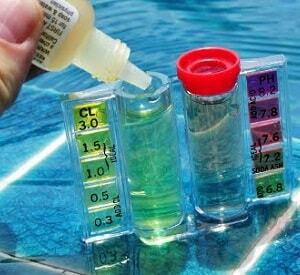 Therefore, you need to use a pH test strip, to make sure the water in your inflatable hot tub is at the right level. The bottom patch on the strip shows the pH of this water is fine. We already mentioned that Poolmaster 4-Way Test Strips are a good choice for testing the correct levels of sanitizer in your hot tub water. They also test the pH value of the water as well. You’ll remember that they have three separate patches on them – the top one shows the sanitizer level, while the third one (the bottom one) shows the pH level of your hot tub water. To check the pH level of the water, dip one of the strips into your hot tub water. Hold it about 6 inches under the surface for a few seconds, then take it out. Wait about 20 seconds, and then check the color of the patch against the pH scale on the test strip container. On the Poolmaster 4-Way Test Strips, the patch needs an orangey-red color for it to be ok.
You’ll see that this corresponds to a pH value of between 7.2 and 7.8. If the pH level is too low or too high, you are going to have to adjust the level. Before you can do this, however, you need to check the Total Alkalinity of the water. 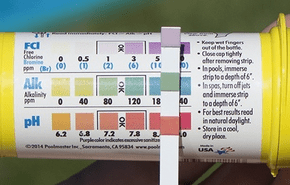 You don’t need to worry about going into great depth about the science of Total Alkalinity, other than to know how it affects the pH value of the water in your hot tub. Briefly, it’s a measure of how good the water is at resisting changes to the pH level which would make it acidic. Basically, if the Total Alkalinity of water in your hot tub is too high, it will create a pH value that is also too high; this will make the water cloudy and create scale on the inner surfaces of the hot tubl. If the Total Alkalinity is too low, then the pH value will be unstable and difficult to control. The center patch shows the TA of the hot tub water. Therefore, before you can adjust the pH of your hot tub water, you need to check the Total Alkalinity is right to start with. Otherwise, you won’t be able to get the pH level right and you’ll be wasting time, chemicals, and money! So, to test the Total Alkalinity (TA) level, get hold of a test strip, such as the Poolmaster 4-Way Test Strips we recommend from Amazon. Dip it into the water, again holding it about 6 inches under the surface for a few seconds. Then take it out and after around 20 seconds, check the TA reading against the color scale on the test strip container. With the Poolmaster strips, this is the middle patch on the strip, which you read off against the middle scale on the container. In our example on the right, you can see that the test strip patch has turned green. If you look at the middle scale, labeled Alk, you’ll see this is within the acceptable range of between 80 and 120 parts per million (ppm). If your hot tub water is within this range, you can go ahead and adjust the pH level as required. If the TA is outside of this range, though, you’re going to first need to alter the TA level before you can work on the pH level. The final chemical you need to consider is calcium. 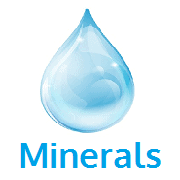 This is an important mineral to have in your inflatable hot tub water, especially if you live in a soft water area. That’s because if the levels of calcium are too low, the water will corrode any working parts and shorten the life of your water heater and massage system. If you’re not sure if your water is soft or hard, there’s a useful map over on the USGS website you can check out by clicking on this link (opens in a new tab). If you are going to need to add calcium to your water, you need to add it every time you fill your inflatable hot tub. If you click on our link and head over to Amazon and look at a product such as Spa Guard’s Calcium Hardness Increaser, you’ll see it’s inexpensive to buy. The great thing about calcium, is that once you have added it to the fresh water, you can forget about it until the next time you drain your hot tub and then refill it with fresh water. Despite your best efforts, there will be occasional times when your inflatable hot tub develops some problems and you need to deal with them. Our easy-to-follow table shows you the most likely problems and what to do. We truly hope it helps! As you can see, there’s a lot to get your head round when it comes to inflatable hot tub chemicals. But in all honesty, once you’ve owned your hot tub for a while, and carried out some level checks and adjustments on the chemicals, it’ll soon become second nature. We also recommend you bookmark this article and refer to it when you are unsure what to do or simply want to refresh your knowledge. For another useful guide, which is related to the area of water quality in your inflatable hot tub, you might want to check out our article When Should I Change The Water In My Inflatable Hot Tub? Thanks for reading!